Springtime, with its first sights of lush green grass and vibrant blossoms, evokes feelings of hope for new things to come and change that leaves us whirring with enthusiasm. If you’re anything like me, this time of year you’re ready for a bit of sprucing up around your home. An easy and affordable way to give any space new life is to add a dash of color—and 2018 is seeing some exciting color trends. This year, expect to see pastels giving way to more intense colors—specifically, jewel tones. 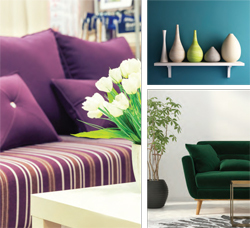 Deep sapphire, regal purple, ruby red and vibrant emerald green can add rich, cozy details to any room in your home. These hues are warm, inviting and mix well with most colors, neutrals, and prints. Don’t let these bold shades intimidate you, because they can work well for most anyone’s home. So if you feel like making a statement in your decor this spring, there are some fun new colors to explore. 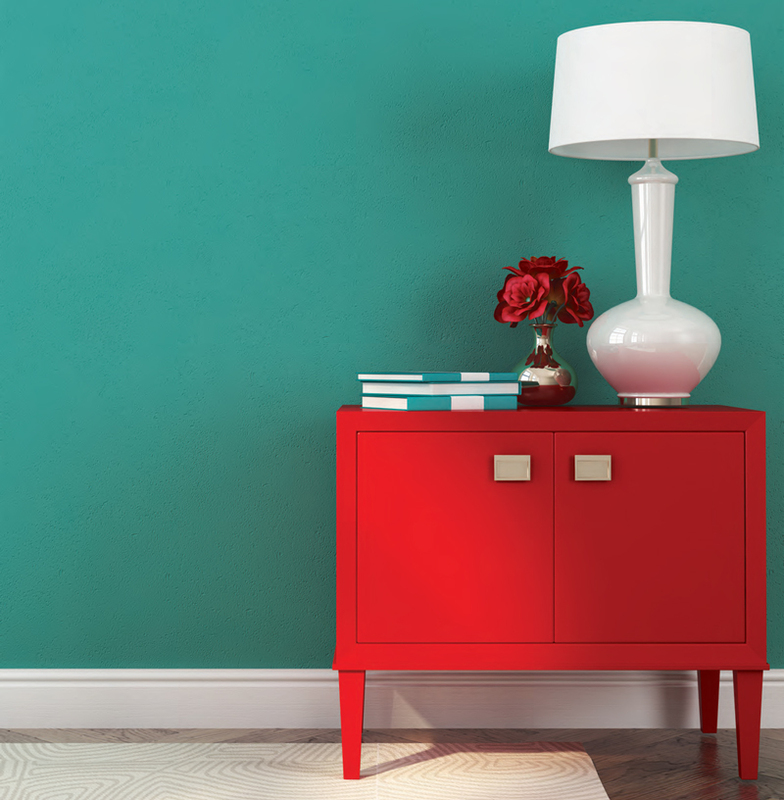 Sherwin Williams has named Oceanside as their color of the year. Described as “a collision of blue with jewel-toned green,” Oceanside is a lovely, deep color that radiates both calmness and creativity. Blue is a versatile color category that inspires different moods depending upon the shade, as well as where and how it’s used. This marine-inspired hue is full of mystery and energy, and can make any room feel vibrant and welcoming. Try Oceanside on your family room or office walls for a bold statement that draws the eye and defines the space. This color also works well in accent touches—for drapes, upholstered chairs or platform beds, or even just a painted bureau or end table. Don’t be afraid to go bold in small spaces! Try sprucing up a powder room with fun touches of blue on your mirror frame, window shades, and vanity knobs. It also pairs well with metallic accents such as light fixtures, coffee and side tables, and wall decor. A trendsetter in the design industry, Pantone has named Ultra Violet as their color of the year. Rich, mysterious, and brimming with artistic flair, deep shades of purple such as plum and amethyst can add a sense of elegance and luxury. While purple can be used in dramatic ways throughout your home, the color can also be used to create a serene atmosphere, especially in meditation areas, to help evoke the sense of being connected and grounded. Not quite sure how to add these lush hues to your home decor? For a subtle touch, try adding a plum-colored area rug or lamp shade to give your living room a bit of depth. Pretty amethyst walls or accent pieces in your office can add a calming, focused aesthetic. In the bedroom, purple pillows, throws, drapes, or an upholstered headboard add a luxuriant touch. And if you want to amp up the glamor, try a purple upholstered chair, sofa, or an ottoman pouf in your living room. 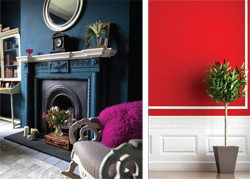 Benjamin Moore has named Caliente as their color of the year. A deep rich red, Caliente is dramatic, lush, and powerful. This color is riveting when paired with a crisp white, but also goes well with creams, stone, and natural wood tones. Try giving your front door a welcoming pop of color using this beautiful red hue. Use it in your library or study for a warm, sophisticated feel. This energetic shade can also work well in a gym, as a dramatic statement in a powder room, or as a fresh update to the classic red dining room. While not named by any specific design company, shades of emerald green have been appearing in home decor in recent months. Whether you’re after a timeless vintage look or a modern preppy vibe, there is no shortage of ways this darling color can be incorporated in your home. For a sophisticated look, try pairing emerald green with crisp blacks and whites in your living room. Emerald green walls evoke European flair, while a velvet emerald sofa can serve as the focal point for a modern-meets-classic look. If you are leaning more toward a nature-inspired vibe, pair emerald hues with wood tones in your kitchen for a fresh springtime feel. If you love jewel tones but aren’t ready to commit to painting an entire room just yet, try adding just a dash of vibrant color— throw pillows on your living room sofa, a light fixture in the dining room, or a cozy chair in a reading nook. An emerald green or deep blue island in your kitchen is a fun way to add instant style. Upholstered chairs and luxuriant area rugs can add a rich and elegant look to an otherwise muted space in your home. Be bold and step out of your comfort zone this spring and try something new! 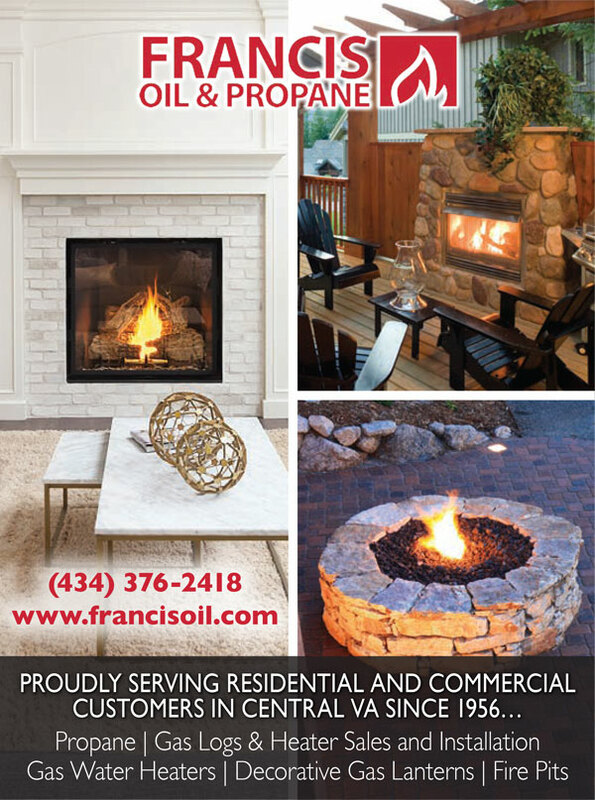 While nature is busy blossoming outdoors, don’t be afraid to create a little growth and new life in your own home.